NASSAU 4000 Sprint highspeed doors have unique product features, which ensure optimal performance and meet most demands in terms of flexibility and individual solutions for production, warehouses and logistics, retail, pharmaceutical, and food industries. NASSAU does not compromise with quality and the 4000 Sprint models are robust highspeed doors which endure wear and intensive usage. 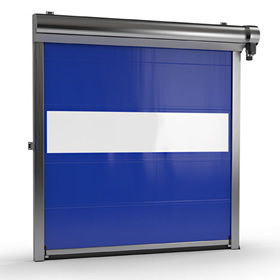 All 4000 Sprint highspeed doors are equipped with an effective safety light curtain as a standard feature. NASSAU 4000 Sprint highspeed doors improve the overall comfort in the daily workflow. The quick opening and closing speeds help create a better working environment and is an energy-saving solution, since draught and cold from the outside can be reduced. NASSAU’s wide range of control options make it possible to find an automation solution, which matches your needs. A wide range of accessories can be selected such as pushbutton boxes, pull switches, radio equipment and radars. An optimization of the daily workflow is a necessity for all modern companies. In that connection, an assessment of the time spent waiting for doors to open and close, should be taken into consideration. By reducing this waiting time, with a NASSAU 4000 Sprint highspeed door, you optimize the daily working routines and give your employees a reliable solution which quickly becomes an important part of the workflow.